Paul Smith takes us on a time-travelling tour of his 30-year old autograph book. The age and historical nature of Jaguar Land Rover means we’re never short of long-serving, faithful employees who have dedicated a large part of their lives to the business. 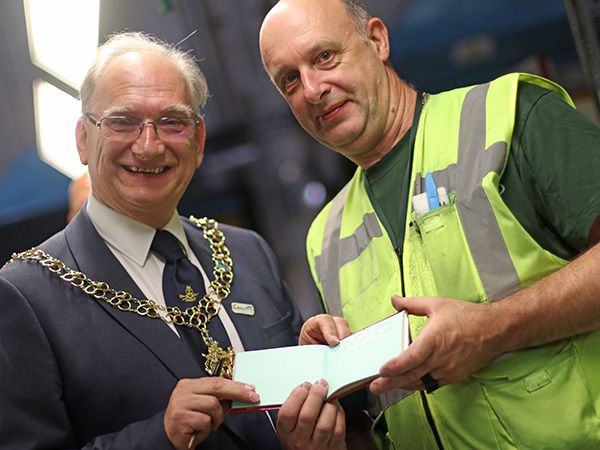 One area where F Block Line 3 associate Paul Smith is unique though is that he can scan back to any o ne of his 34 years with us and tell us where he was and what he was doing at any given time thanks to a priceless artefact he’s carefully crafted at work over three decades. 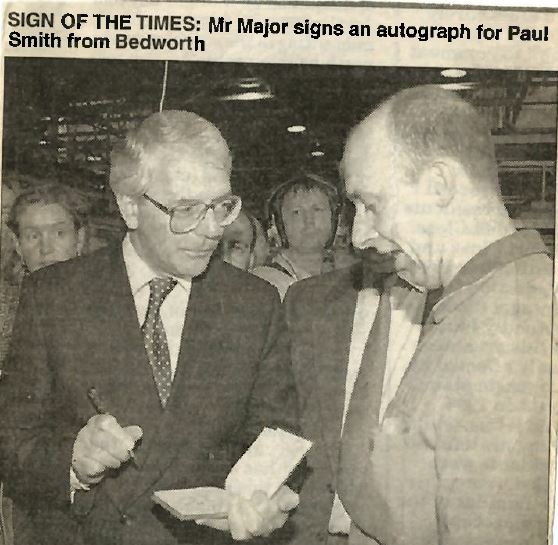 Paul is an autograph hound and, given Jaguar’s ability to attract the attention of celebrities and dignitaries across the world, he’s managed to build up a catalogue of signatures from the globe’s great and the good during his time working exclusively on XJ. The dad-of-two started work as Browns Lane back min 1984 where his collection began and over the years its swelled to represent a ‘who’s who’ of famous names, all of which he can remember signing his famous book. He kicked things off with Lovejoy’s Ian MacShane but his pages, none of them dog eared despite 30 years of use, have since been penned by such high profile figures as half the England football team, late Inspector Morse actor John Thaw, John Major, Carol Vorderman and even global superstar Jay Leno who all picked up a pen for Paul when they came to visit the factory. The 57-year-old added though that to him, it wasn’t just a book of signatures but also a book of his life. “It reminds me where I’ve been, what I’ve experienced, who I’ve met and it even gives me flashes back to the conversations I had with people all those years ago. He recalls one conversation with John Thaw’s wife who confessed that her husband had ordered his new XJ because he’d crashed his other one! You flip through Paul’s book though and it jumps out that he has as many signatures of colleagues and former managers as he does of celebrities. We asked him why. “You spend as much time with people at work as you do at home so I’ve always seen the people I work with as extended family. This is my work family and I want to be able to remember them as much as anyone else. 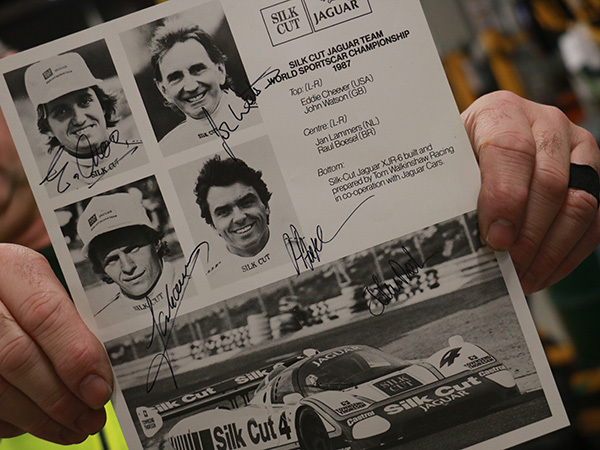 Paul’s passion for motorsport means he also keeps a scrapbook filled with newspaper clippings of Jaguar’s past successes on the track including a signed photo from the Silk Cut Jaguar World Sportscar Championship Team from 1987. 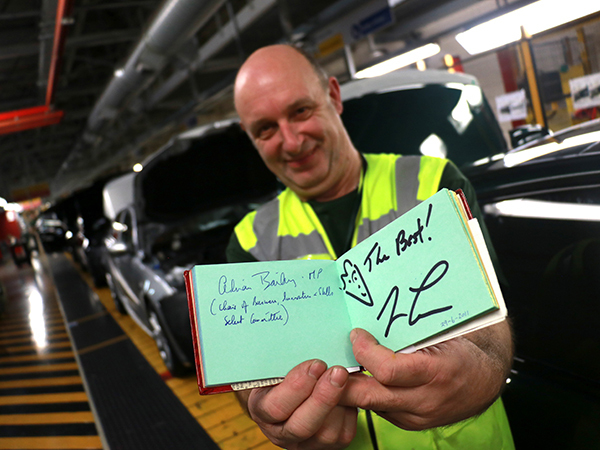 More than 30 years of collecting autographs though begged us to ask the question…who was his favourite celeb that he’d met? “Mitch Evans,” he said, referring to current Formula E Panasonic Jaguar Racing driver Mitch Evans whose signature he secured when the youngster visited CB for a site tour before Christmas. Paul shows no signs of retiring just yet so we’re hoping he gets the chance to grab a few more signatures to mark more chapters in his career. We’re just grateful he let us hold his leather bound time machine if only for a minute!